One thing I always find myself doing is searching for something that was said on the podcast and not being able to find it quickly. I can’t imagine I am the only one with this issue so I decided to start highlighting parts of the podcast and expanding on them, if necessary, since the guys try to cram a ton of information into an hour. In Episode Ep. 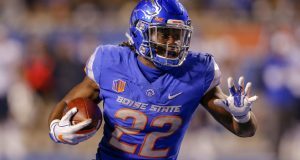 251 – Way Too Early 2019 Dynasty Rookie Mock Draft the focus obviously was on a first look at the 2019 draft. A draft that is very under appreciated. Rich kicked off the ‘draft’ torn between Josh Jacobs, who is becoming a man crush for Rich (Spoiler he’s #2 on this list,) and N’Keal Harry of Arizona State. The guys liked how Harry can go up and get the ball. He may be slower but his ability to get to the ball is going to be under appreciated. He comps to Dez Bryant and landing spot will be important for Harry. His floor is Alshon Jeffrey or a Wide Receiver 2. “Declaring after his Junior season Harry has had back to back seasons over 1,000 yards, catching passes from Manny Wilkins. N’Keal Harry’s size is a huge strength. Measuring in at 6’4” 215 pounds, Harry is a great jump-ball receiver. It doesn’t hurt that his hands are absolute mits too. He can reel in absolutely anything and has solid, steady hands. 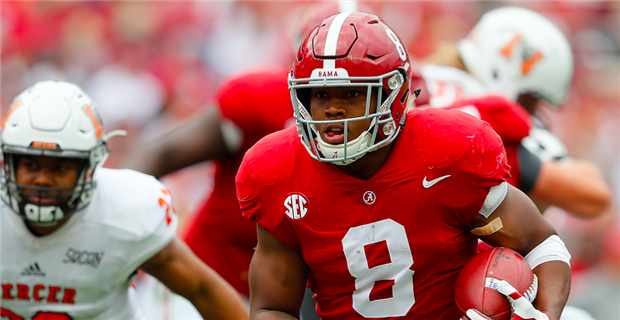 Next the guys explored Josh Jacobs from Alabama, who if he’s drafted by the Chiefs will be a Saquon Barkley type running back. He is 5’11, 220 lbs and comps very close to Alvin Kamara. He catches very well. He is a 3 down running back and will run over and through people. He also blocks very well helping his value. Jacobs was in the support role at Alabama this year playing behind Damien Harris. This is very similar to another duo of Alabama backs, Nick Chubb and Sony Michel, where Michel was the support back. Jon Diment once again gives us the deeper look at Jacobs at the link above. Diment highlights Jacobs is lightly used with only 120 touches in 2018. He averaged 5.3 YPC last year, down from his college average of 5.9 YPC. He is very agile and explosive, expected to run a sub 4.50 40-yard dash. At number 3 is Kelvin Harmon of NC State. He is a very safe player. Boxes out well, works the middle of the field well and is a red zone stretch. He comps to Anquan Boldin, he is not real fast but he is really strong and will make a difference no matter what team he goes to. He should have a solid floor of a wide receiver 3 with a very low chance of being a bust. D.K. Metcalf of Old Miss comes in at 4 but Rich is unsure on him. He comps sadly to Kevin White. A highly productive college receiver with size and athleticism but far too often guys like him look so good on limited tape but then bust like White did. Most of the routes he ran were vertical routes without much variation. He did have some problems with drops and route running. He may be someone who falls quickly in future mock drafts. Number five is David Montgomery, RB from Iowa State, who has great vision and burst. Another very safe option for your draft. He doesn’t do anything amazing but blocks and catches well which makes him a 3 down back. He hits the hole well. He should be drafted high and into a good spot. He should be a RB2 in his rookie season. Number six is AJ Brown, which Matt prefers over DK Metcalf. The Ole Miss Junior has good hands, not overly athletic but has the ‘wiggle’ to get around defenders and runs routes well. He has great upside but could have a floor of a low end WR3. Hakeem Butler comes in at number 7. At 6 foot 6, 205 lbs, he runs well and can make the crazy catches. With his size, he could easily get double digit touchdowns every single year. The ideal landing spot for Butler would be the Patriots and Matt would move him up to 1.4 If that happens. There are still some questions on his acceleration and Matt wants to see how he moves laterally. Rich loves this guy and thinks he will be ‘Godzilla’ among wide receivers. 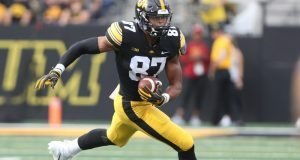 Noah Fant is the first tight end off the board at #8. 6’4, 230 lbs is the 1st of 2 Iowa TEs in this mock draft. Iowa has been producing great Tight Ends (George Kittle). This will be a good player for any team needed a tight end which is nearly every fantasy team as injuries and time have taken out good tight ends. Parris Campbell is number 9. Campbell, a very fast receiver, has been receiving passes from a pro QB in Dewayne Haskins catching 90 balls and over 1000 yards. He is explosive and athletic. He is an upside risk that may slide down the board. He comps to Curtis Samuel. He will be a great value if he falls into the 2nd round. Riley Ridley is a wide Receiver out of Georgia going #10 in this mock draft. Ridley led the Bulldogs in receptions. He is 6’2, 200 lbs and is Falcons WR Calvin Ridley’s little brother. He has great upside potential. At number 11 is Irv Smith Jr, TE out of Alabama had 700 receiving yards, up from 128 yards the year before. He is a large athletic tight end that could be a great red zone weapon on the right team. Rounding out this draft is TJ Hockenson, Tight End from Iowa. He is a great blocking TE that comps to OJ Howard. He led the team in receptions totally over 700 yards and six touchdowns. Hockenson could be better than fellow Iowa Tight End, George Kittle. If you are someone who needs Tight Ends or Wide Receivers this will be a good draft for you to move up in and many top picks can be had cheap because people are giving up on this draft early. Hopefully this will help you find those rookie details you know you heard on the podcast but can’t find it.